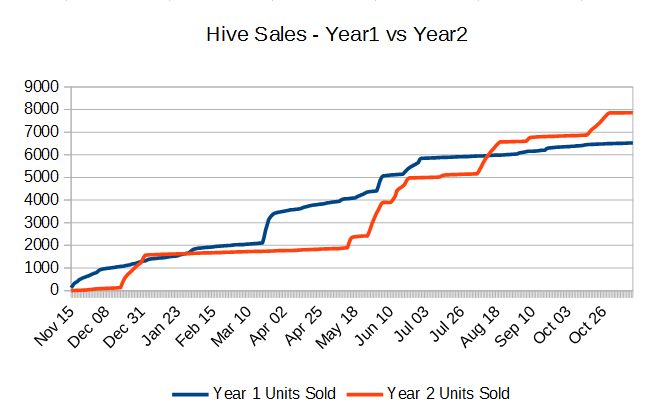 As a small two-person team, we were able to sell more units of Hive in it’s second year after launch than we did in the first – despite living through the “Indiepocalypse”. This experience flies right in the face of the conventional wisdom of the game sales cycle being mainly one giant launch spike followed by a death-taper-to-zero afterwards. In this post, I’ll endeavor to tell you what we did to achieve this, and to share some other insights we learned along the way. BlueLine Game Studios is a small indie game studio – specializing in making digital versions of amazing board games. The studio consists of Sean Colombo (author of this post) and Geoff Brown. We’re anywhere from 1 to 2 people fulltime; usually one fulltime, one part-time. Years ago, we built a successful web startup together, then 4 years ago we finally became professional game devs with BlueLine Game Studios. After first releasing Hive on Xbox 360, we pivoted and after many more months released Hive as our first title on Steam, just over 2 years ago. Since that time, we’ve also released Khet 2.0, Reversi, and Simply Chess. All of our Steam titles run on Windows, Mac, and Linux. Not all game developers will be able to benefit from what we’ve learned, but a very large number will. In this flooded market caused by the Indiepocalypse, there are many great games that don’t get nearly as famous as they should (eg: Escape Goat 2, Cannon Brawl, Duskers, Rymdkapsel). Making a great game is not sufficient for it to be successful, but it should be seen as mandatory. Fortunately, we knew when we licensed Hive that the gameplay of the board game was amazing. Our digital conversion seems to be satisfactory to the community and it is currently recommended by 95% of Steam users that review it. There are plenty of articles about how to make good games, and that’s way outside the scope of this article, so we’ll just take it as a pre-requisite. Additionally, the gameplay should be something that has a lot of replay value (which is a large part of why boardgames are our strategy) and they need not to be “zeitgeisty”. For example, this article wouldn’t be very useful for a game about the 2016 American Presidential election, because it’s unlikely it will perform well in 2017. Each paragraph is a different lesson. Subsume their knowledge! Our single biggest learning was that the only marketing endeavor which drove significant sales spikes was Steam visibility. Significant visibility on Steam comes from several types of events: Early Access Launch, Full Launch, DLC Launches, Mac/Linux Launches, Seasonal Sales (Summer & Holiday), and manually created 1-2 week Discounts. Another huge lesson was that almost all revenue comes from sales-spikes, there are a decent number of ways to cause these spikes, and we must continue to cause them in order to survive. As mentioned before, this contradicts the common assumption that games are very launch-centric and shows that Steam games can be run almost as a service. It’s important to note that if we’d just given up on Hive after launch, our data would have looked like everyone else’s showing that launch was important and the harsh realities of the Indiepocalypse crushed us after that. If we’d stopped investing in Hive after it’s launch month, we’d have missed out on about 70% of the sales we’ve made so-far. None of those spikes happened automatically. Every one of them was directly caused by things that we did. Later in the article there is a section which explains the various things we did to cause spikes. We didn’t do any paid advertising for Hive. We tried several different paid advertisement locations for another game and none of them ended up having a positive return-on-investment as far as we could tell. I gave talks at the East Coast Game Conference in 2013 (“Turn Based AI“) and 2015 (“Cryptography for Game Developers”) and we also had a booth there in 2015. I also spoke on a couple of panels at PAX Dev 2013. This was a blast and I met a lot of really interesting people that I’ve learned a ton from. This didn’t lead to direct sales spikes, but I still think it was extremely valuable. Sharing what we’ve learned also felt really fulfilling. Hopefully we’ll be doing more conferences, talks, and panels in the future. We almost entirely neglected press. This could be due to our background in consumer-websites, but after a very short period of posting links to the game on obvious places (facebook, twitter, etc. ), we got sucked right back into bug-fixing and new features rather than contacting more press like we should have. We did get a little bit of press from indie reviewers & let’s players. The only press we got from a big outlet was IndieGamerChick re-reviewing the Steam version (she’d reviewed the Xbox 360 version earlier). None of the press that we got caused a visible spike in our sales-data, but we think that’s largely because we didn’t do very much work to get press. The various reviews & videos are all greatly appreciated and they probably lead to some new fans trickling in over-time but just didn’t cause a visible, instant spike in sales so they’re challenging to measure. Learning how to get press is an area where I think we really need to improve. What were we able to do to cause spikes? The board game Hive has 3 expansion pieces. They each significantly change gameplay and took a while to make, so after we launched the game, we got into creating & releasing those as soon as we could finish them. Each launch resulted in more visibility on Steam and drove sales of the main game. Steam users all seem to hate DLC in a different way – I’m fairly convinced that there is no way to do DLC that users agree is the right way… they will always be mad – so it’s always stressful. We lucked out since we’re making a digital version of a board game that exists in stores (and has actual expansions) so we did a direct analog to that sales system. This means we had a system that at least we feel good about. Judging by the sales of the expansion pieces, I think people understood our reasoning overall, but if we got a lot of flack for this system, be aware that you’re likely going to get a lot of complaints for your DLC regardless of what you do. It’s just not something that gives players warm-fuzzies and we’re in an industry where warm-fuzzies and happiness are a large part of what we’re selling. Another caveat is that there is a bit of a limit on how many you can do, so this isn’t a good strategy for getting a bunch of spikes over the long-term. We did the 3 expansions and that seems to be the limit of where it makes sense for our game (unless Gen42 Games releases new expansions for Hive in the future). After Hive, we’ve been launching all games with Mac & Linux from the get-go, but originally we didn’t have the porting figured out. For Hive, we launched the Mac and Linux versions about four months after the full-launch of the game. An interesting side-effect was that the game showed up in “New Releases” on Mac and Linux pages of Steam. This, coupled with a 20% off sale on the game (which matched our initial launch-week price), seemed to drive a fairly big week-long spike for the games. The launch-spike for games overall is usually much shorter, but as of summer 2014, it was taking a week for a game to get knocked off of the New Releases list on Mac. That list is probably also flooded by now (but less than for Windows), so your mileage may vary. 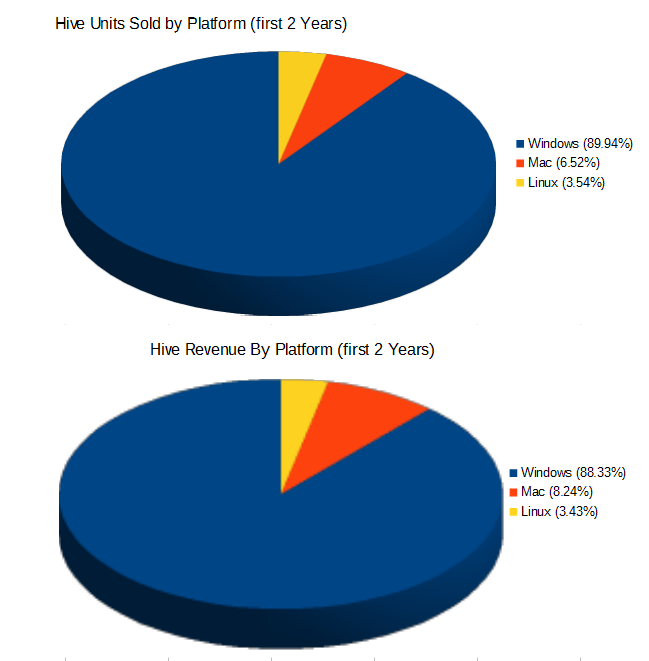 As you can see from the charts, not only did they cause spikes, but they ended up being an additional source of revenue equal to almost 12% of our total revenue for the 2 year period since Hive’s initial Early Access launch. Running sales gives you more visibility on Steam, and honestly many users have probably added your game to their wishlist and are just waiting for a sale. Sale prices have become the norm on Steam. Due to international exchange rates and grouping of items into two-packs or Complete Packs (bundling the game with the expansions), it’s a bit tricky to calculate a perfect representation of how cheaply things sell. However, in the United States a single copy of Hive is $9.99 and a two-pack ends up being ~$7.99 per copy, and if you get a single Complete pack it can get as high as $15.99 per copy. If you take all of the copies we sold and divide by the total revenue from these games (this excludes revenue from DLC that was sold separately), it ends up at at an average of $3.62 per copy. 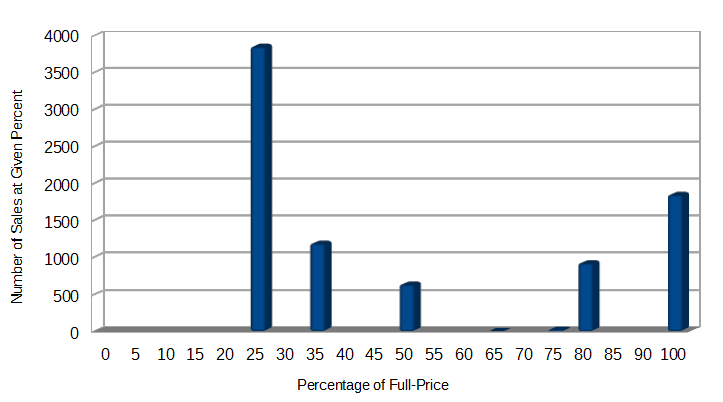 Since we have so many different starting-prices, perhaps a more useful way to grasp the exact impact of sales prices is to see a histogram of volume of sales at given percentages of full-price. 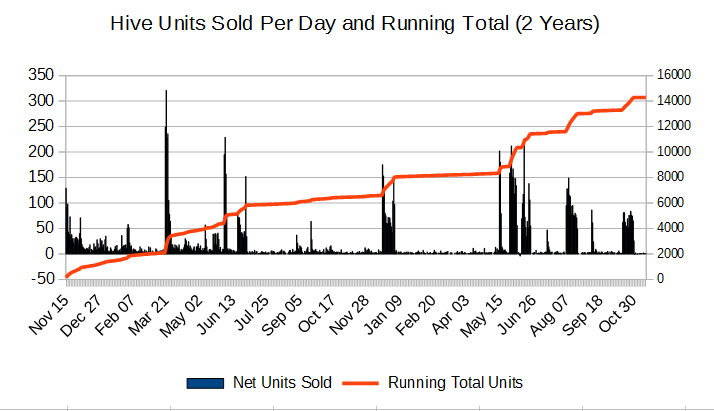 For example, this chart is showing that we sold about twice as many units at 75%-off (25% of full price) as we did at full-price. The chart doesn’t show the total revenue, so since 100% is 4x the revenue-per-copy that 25% is, then we still made about twice as much money on full-priced copies as heavily discounted copies. Side-note: There are sites like SteamDb that track the price-histories for games, so don’t do any crazy 90% off experiments early on in your game’s lifespan or users might hold off on buying your game, expecting it to go to that level again. If people expect to pay 20% off full-price at launch, then slowly get discounts over the following months then users will be motivated to buy now if they can. Hopefully they will only wait if they’re price-sensitive enough that a few months are worth a few percent to them (we’ve all been there). This ends up working out pretty well for everyone. When updates are announced in conjunction with sales, they lead to more units. We often announced an update in the middle of a sale-week and saw a second peak. This also indicates to potential buyers that you’re not just discounting an old, stale game, but are just selling a game that’s both mature and still growing. Even when we’re not doing sales, we do a quite a large amount of updates. We put some of our other games in non-Humble Bundles a while ago. The revenue was negligible but dumping thousands of copies did a good job of beefing up the online communities so that there were always more people online. Be responsive to the community! I read every forum post for all of our games (even Simply Chess which took me about 10 hours per day right after launch) and respond to almost all of them. Being present (so that users know you care) and doing bug-fixes and forward development based on their suggestions ensures that you have a product that’s actually going in the direction the market wants and it lets users know that you actually care about them even after you have their money. As a caveat: I’ve never tried ignoring the community so I really don’t have a scientific comparison to say that this has been more useful than doing the opposite (being a jerk and completely ignoring your users). Anecdotally though: several of our Steam Reviews have mentioned that part of what they liked about our games is that we’re so responsive in the forums. Our Full Launch sold a lot more units than our Early Access launch which is the opposite of what I’ve been reading in a lot of places. This might be due to our lack of press – I’ve read that press view your Early Access launch as your only launch because your game is “old news” by the time it comes out. Another possibility is that this could just be because our Early Access launch was over 2 years ago and things may have changed since then. Your mileage may vary. If your game has multiplayer, build the online community. If a player goes on and there is nobody to play against, they quickly abandon the lobby assuming “nobody is ever online” and then another person may come in 5 minutes later and think the same thing. This means that there is a specific tipping point where there is always someone to play with, which keeps both of those players online longer and when the next person comes in, they also see an active community and stay online playing. It is a really long arduous journey for an indie, but keep iterating until you pass that tipping point. We spent months of development on this before we started to see it pay off. We reworked the Online Game Menu Screen, wrote our own group-chat, etc. but it wasn’t until we released Asynchronous games (which took a lot of work) that the online community really started thriving. We’re using the same engine for all of our games which subsidizes bug-fixing and new features. If you have a thriving online community, it seems to raise the daily sales at full-price. Even though it’s not a ton of sales, 5 sales per day for a month (between spikes) is much better than 1 sale per day for that month. It adds up. We’re fairly niche since we make turn based games. If you’re not niche, you might get better results from PR and even more viral growth from an online community. Some sources of error in the data: these stats were just from Steam. This ignores the Humble Store and Humble Widget sales just for simplicity of pre-processing all of the data to make these charts. Also, we mainly used units-sold rather than total revenue. The raw revenue was pretty flat Y1 vs Y2. There are a lot of different currencies so I presented the data as percentages-of-full-price in some spots. The actual amount earned per unit is much less clean due to the variance in currency conversions. Change is constant. The Indiepocalypse isn’t some big one-time shift in the industry. If you read The Ultimate History of Video Games (great book), you’ll realize that change is extremely normal in game development. The entire market has been changing every couple of years since its creation. The fact that Steam has been a solid place to market your game for many years in a row is actually a fairly impressive amount of stability. Get used to change and continually run tests to figure out what the current state of the world is. I’m so bad at marketing that somehow, I’ve gone this whole post without asking you to buy Hive! Please buy our game: Hive on Steam. The indie dev market is (and has likely always been) crazy. Making a good game is absolutely mandatory for success but despite what you read, it is never enough on its own. By running your own experiments, tracking metrics, and learning from the experiences of other developers (eg: reading what I’ve written above!) you can survive despite the challenges of the day. It’s always the Indiepocalypse. The Indiepocalypse never changes. Why aren’t there more board games on PC? …Tablets? …Xbox? I often hear the question of why there aren’t more board games on a certain platform. The short overarching answer is just that digital board games are a niche-market, so big game companies aren’t often willing to take the risk of making them. However, I think there are some hints as to where board games will start showing up in the near future. I’ll be working with the assumption that other than a few outliers (Monopoly, Risk, etc.) that are made by EA or some other huge publisher, most digital versions of board games will likely be made by indies. This is a complicated one, but I think that we’re not going to see many new board games on consoles in the near future. The old-gen consoles were a mixed-bag for independent developers. Xbox 360 was really the only one that indies could easily get into. BlueLine could probably get into all of them at our current size, but it excludes any first-timers. Additionally, after Microsoft announced that they were no longer supporting XNA, the amount of games that sold on Xbox Live Indie Games (their deeply-hidden indie channel) dropped off a cliff. What about the current generation? Sony has gone out and recruited a bunch of indies to build games for the PS4… but I doubt they’ll continue doing that much longer after launch – they’re flat-out funding games and that’s a big financial investment. Xbox is again trying to be accessible to indies with their “ID@Xbox” program (which we’ve been accepted to), but there are two major things holding back board games from Xbox One*. First: it’s expensive. Unlike other indie-friendly locations where the startup costs are around typically a couple of hundred dollars, a very lean Xbox One indie game runs upward of $5,000. Secondly, even in 2014, Xbox 360 still has about twice as many sales as Xbox One. A market with high costs and low sales isn’t great for niche games. It’ll be a while before the install-base of new consoles grows enough that a bunch of board games start popping up on there. There are a decent number of board-games coming to PC (especially on Steam) over the past year or so. I think more will continue to show up, just slowly. We released Hive and Khet 2.0 this year, and just our two-man team still hasn’t been bumped off the list of 10 Newest Releases tagged with “Board Game”. It’s entirely possible that our next game, Reversi will bump Hive off of the most-recent list, if no new board games come out in January or February. PC, Mac, and Linux are probably the best platform for selling digital versions of board games at the moment. Smart phones are a great form-factor for many board games, and a bunch of games came out over the year since they became popular. However, many have had a rough time with sales in recent months/years. Most digital board games are made by fairly small devs: we survive on the Steam store’s visibility and we’d have a really rough time in mobile because you need to be on the “top downloads” list to get any traction there. Board games are usually too niche for that to happen organically and it’s too expensive to buy the number of downloads needed to fake it. This “faking it” is the current modus operandi for most mobile games. They buy huge amounts of downloads (via ads in other games) and hope that it generates enough of a following to get them to the Top Downloads list where they get to see if they’ll actually get traction. That’s usually not a great strategy for board games! Board gamers often lament the lack of titles on tablets – which seem like the most ideal medium for digital board games. However, I think that’ll happen even more slowly. Even though tablets are a fantastic device for playing games, the market is currently (unfortunately) just an afterthought. The games on there now are mostly because it’s easy to go to tablets from a mobile game. However, the market for tablets themselves are really small (around $3.6b compared to about $20b for PC). The reason market-size matters is just that it’s an indicator of how many games you can sell if you have great exposure. Tablets are a just a very small market at the moment, and aren’t expected to catch up to PC for about another 5 years. We’ll get our games on tablets eventually… but it’s going to take a while. Hopefully not more than a year or so! It’s really hard to monetize a straightforward board game in HTML5 at the moment. If you saw Goko (who got the license to Dominion) and thought that they would ever be able to earn enough to support their big dev team & pay back all that venture capital… you probably weren’t paying attention to the margins in this industry. 😉 Nobody has made it work correctly yet. The only board game sites that are currently surviving seem to be those that don’t make any money & don’t pay any royalties. Since most of those are hobbies, you can probably expect a handful of very basic implementations to continue to come out… just not with paid licenses. What I’m most excited for in the future is cross-platform online play. It’s super time-consuming to get it working (in part because you literally need to create the game multiple times**) but it should be a lot of fun and make it easier to find online games with other people instead of having an already-niche community silo’ed across several devices, as is currently the case with Hive which currently has different 5 different online communities. Do you know of any digital board games coming out in the near future? Let us know in the comments below. *: There are actually three, but one of them is technical and it’s covered by an NDA so I can’t talk about it until it’s fixed. **: I realize that Unity/MonoGame/etc. take a ton of work away from porting, but if you want the game experience to be really good, it should be designed once for consoles (with gamepads) then another way for PC/Mac/Linux (to allow gamepad and/or mouse/keyboard) and have another – probably significantly different – interface for touch/drag devices with unreliable screen resolutions. Hive is coming to Steam! Pre-order now for 30% off! Game will track over 40 stats on Steam and you can earn 30+ Steam Achievements. There will be 2 new levels of AI. Since even low-end PCs are typically a lot more powerful than Xbox 360s (because those are now quite old) this gives an opportunity to have the AI make much, much better moves in the same amount of thinking-time. Seamlessly switch between using your mouse/keyboard or playing with a gamepad. The first release will be on PC, but we hope to release it on both Mac and Linux soon afterward. Buying the game means you’ll get a Steam key once the game is released. This will allow you to play on any/all of the platforms once each platform is available (eg: if you buy now, you can play on PC as soon as that’s released and you do not have to re-buy it to play on Mac when the Mac version comes out). If you can’t see the widget above, you can click this link to pre-order Hive. Have an old computer? If you’re worried about compatibility, please check the minimum requirements on the Steam Store page (scroll down a bit or search for ‘System Requirements’). UPDATE: You can now buy this game on Steam ‘Early Access’ which will let you play the incomplete beta immediately, and you will automatically be upgraded to the full version once it is released. Please click ‘add to card’ on the Hive page on Steam.